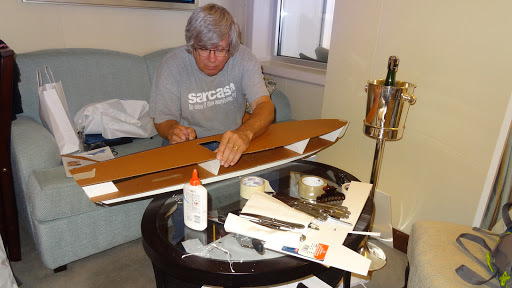 BLOG Vacation "Ship Building Contest"
The ongoing joke around the shop is my abnormal aversion to going on vacation. Everyone who knows me, knows that I would much rather spend my time in the shop building and creating. I also have a tendency to work seven days a week throughout the entire year. And most days are 12 to 14 hours long. This is you might imagine can be rather difficult on a marriage. As a compromise for putting up with my abnormal lifestyle Carol gets a vacation of her choice anywhere in the world for 2 to 3 weeks once every 12 to 14 months. And the best part for her, is that I pretend as convincingly as possible that I’m having a great time every year. 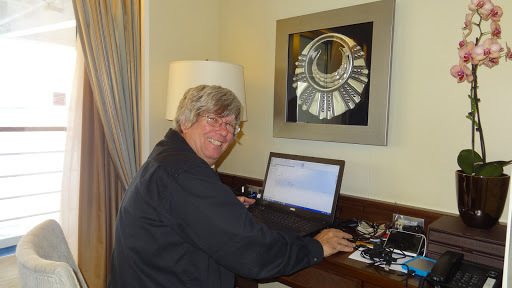 This year’s vacation was a cruise from Buenos Aires Argentina around Cape Horn to Santiago Chile. 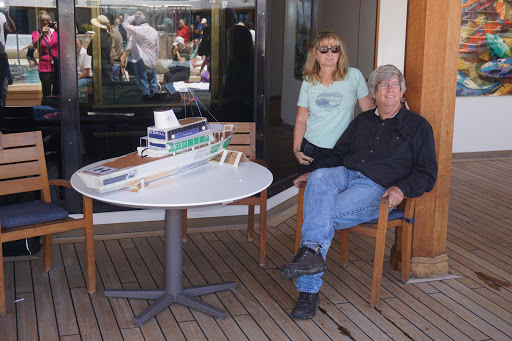 This is the first year that we have done a cruise where there has been days at sea. Normally Carol likes to be in a different port every day. This is probably to keep my ADD at bay by having something for me to do. 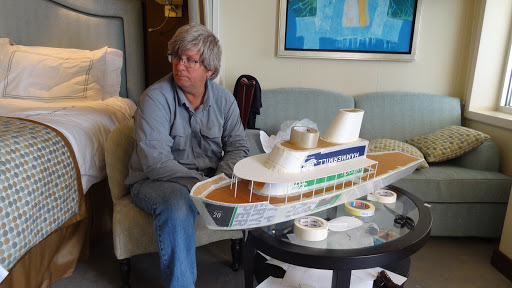 This year however the cruise involved three days at sea and Carol was unsure whether I would go stir crazy. 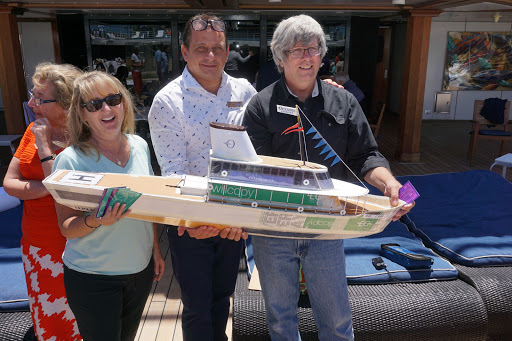 Five days before the end of the cruise Carol read in the morning ships newsletter that they would be having an on-board ship building contest. “Eureka” something for Brian to do. 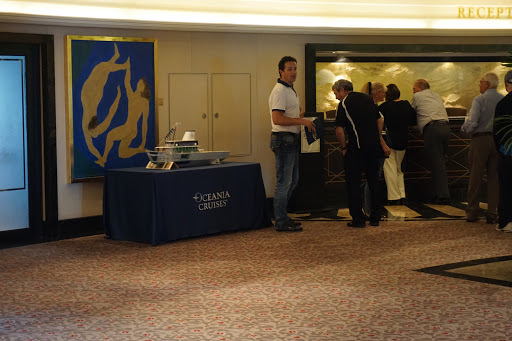 After breakfast we attended the meeting where the cruise director laid out the ground rules. 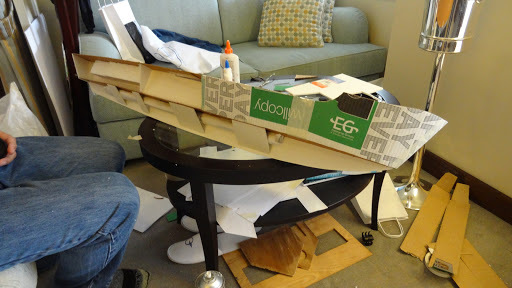 The basics were to build a ship that would carry 6 cans of soda. 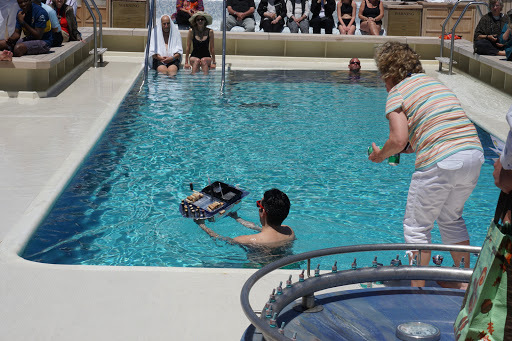 And on the last day of the cruise the competition would be held in the swimming pool on board the ship. 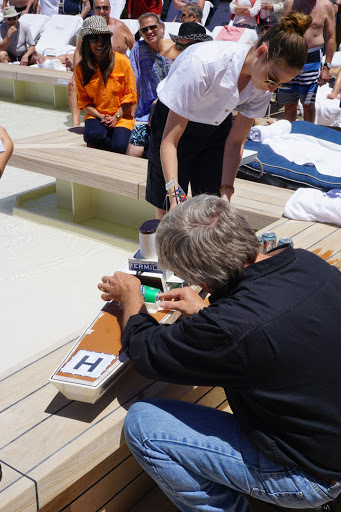 The judging would be conducted by several crew members including the captain of the ship. The judging would be done based on visual appeal, seaworthiness, and storyline associated with the purpose of your ship and its itinerary. During the rules meeting it looked like we were going have about six different ships enter into the competition made up of six people per team. 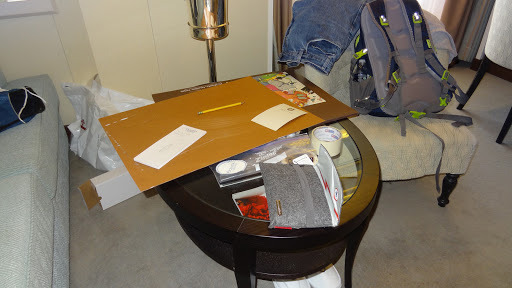 So we were off and running all we had to work with was materials that we could scrounge on the ship and although it was not explicitly stated we were pretty much working with only supplies that we could round up on the ship. This is because the next three days involved at sea days where there would be no access to shore for materials. 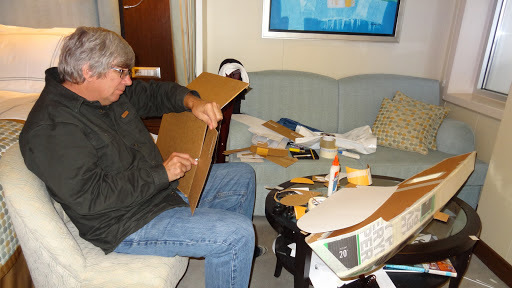 Even if we were going to go ashore to get materials it would be way too late in order to complete our ship. And the last two days would be spent on excursions at sure leaving only a few hours at night to complete the project. 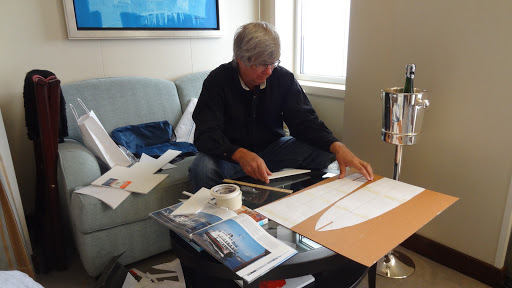 The most difficult task by far was not in designing the ship but rather identifying any potential materials that we may have access to to be of the building ship from. Not only materials but tools as well, how to build a ship without any tools. I’m so accustomed to being able to do amazing things but it’s normally associated with having the equipment necessary to accomplish these tasks. So, first up put Carol to work on finding materials. First stop the art department where we were able to scrounge some left over cardboard, a pair of scissors, a box cutter and some glue and masking tape. Fortunately I had brought my laptop along, and as with everything I decided to start the design in Solid Works. 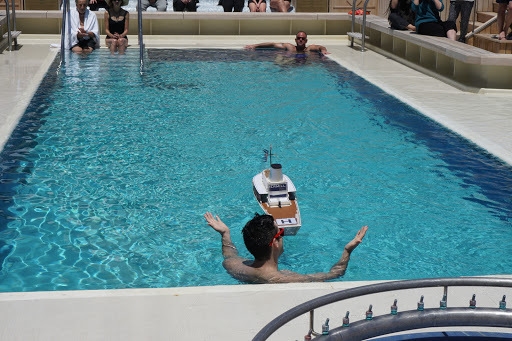 One of the design criteria was that the ship would be tested in the pool no matter what the weather conditions outside. 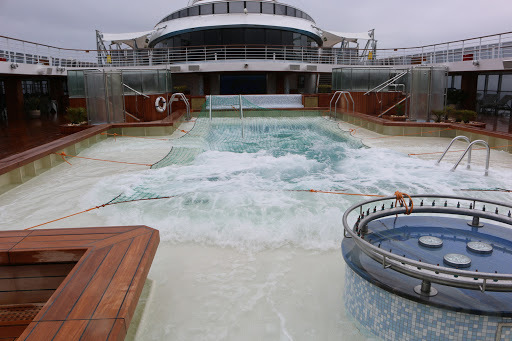 During several days at sea the conditions in the pool look rather dramatic when going around the Horn. So designing the ship to be able to withstand these kinds of conditions was going to be necessary. The design had to be based primarily around the ability to carry the six cans of soda. And of course these cans of soda would have to be located fairly low and if not act as ballast at least reduce the necessity for additional ballast. 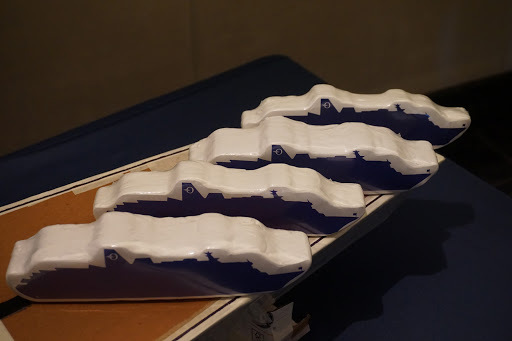 After the designing the compartment that would hold the soda cans, we had the basic shape that the rest the ship was built around. After lofting the hull and the keel we started cutting out parts. Carol had managed to scrounge an old piece of art board left over from the art room projects which acted as a nice rigid piece of material that we could manufacture the keel from. 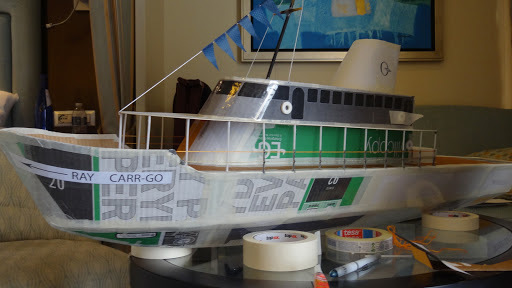 Next we cut out the main deck and included on top of bulkheads that were attached to the lower deck where the soda cans would rest. 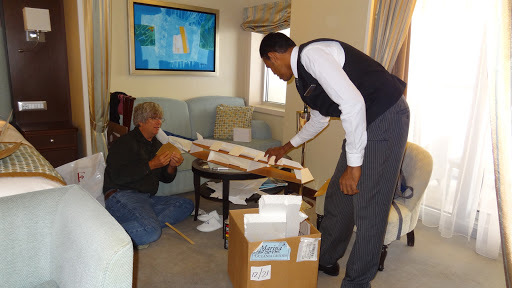 Our Butler Ravi was getting in on the act by helping us locate materials and stopped in on a regular basis to inspect the progress. 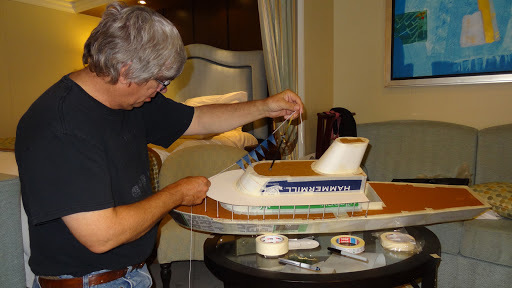 The keel was reinforced with foam board and stacks of kitchen knives from the galley were wrapped in sick sacks And glued to the keel as ballast. 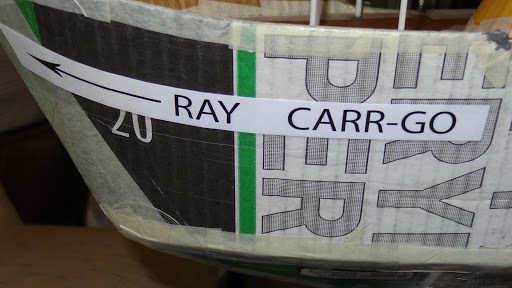 A trip to reception garnered two boxes that were used to pack paper in which we were used with the corrugations vertical which allowed us to wrap the cardboard around the hull. 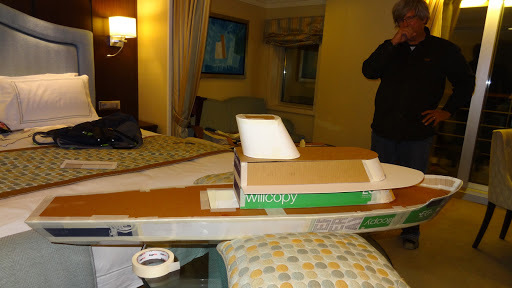 We now have the hull skined with cardboard from the paper boxes. Now we are starting to make the additions to the upper decks. 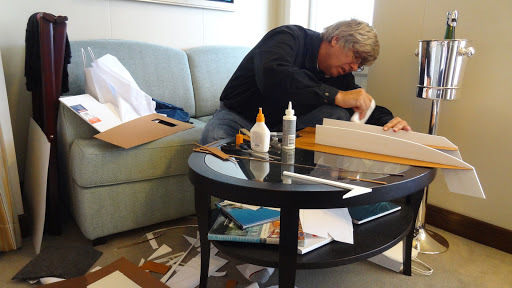 Cutting sections of flat cardboard out of the paper boxes to be used for different components. 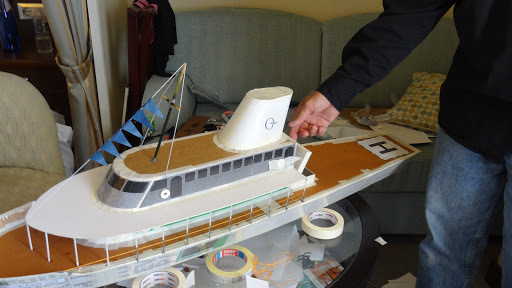 The next decks are added to be ship and were using water bottles full of water to weigh down the deck while the glue dries. 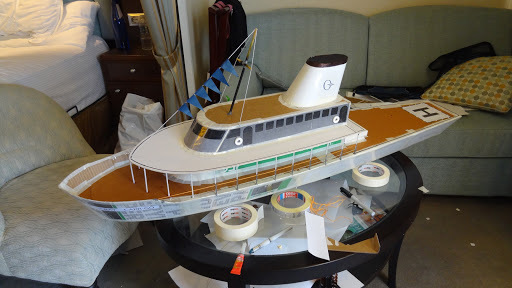 Next we had to add a smokestack and the upper deck. You can see the cargo hold right behind the cabin area where we will load the soda cans into the lower portion of the deck. 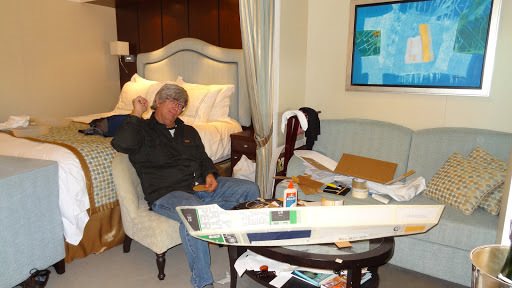 Next we stripped the medicine cabinet of Q-tips to make the stanchions for the upper deck platform. We created a flag mast from stealing one of the sticks that held the orchid upright in one of the planters for the state room. Carol found some yarn from the needlework class on board the ship which we used for making railings and to hang flags from. The onboard store had a candy section which we obtain some lifesavers mints to make the Life rings which we glued throughout the ship. 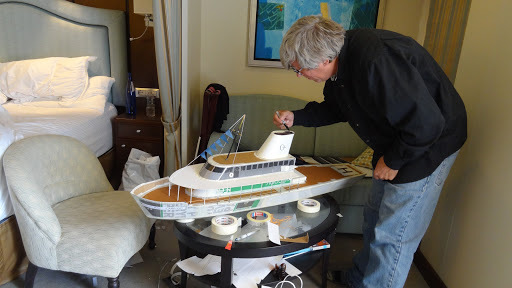 The Butler was able to come up with a magic marker for us to create some lines around the ship for detail work. Coloring the smokestack black with the magic marker made it stand out a little bit better. 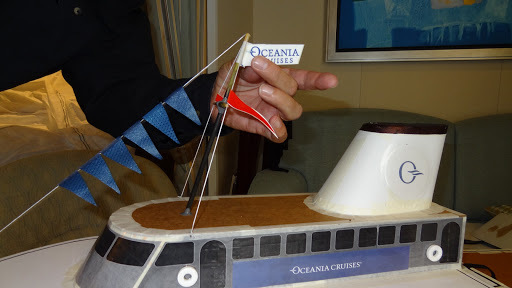 The lids from some of the cups were cut to use the Oceana logo which we used for adorning the smokestack. 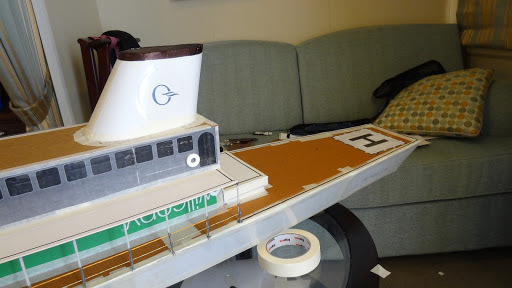 We added a helipad to the back of the ship. 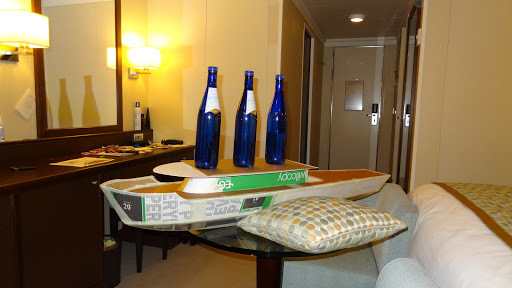 And with a few more adornments to be ship we were ready to go during the sea trials on the last day of cruising. We arrived poolside not knowing what our competition might be like but still fairly confident that we had a competitor. We soon realized that our competition was not going to be too stiff. It turned out there were only three other competitors that were able to finish building their ships. This was the fourth place winner. The third-place ship ended up flipping over and losing all of the cans. The ship was primarily built out of wine corks, I assume that were obtained from the empty wine bottles consumed during the construction of the vessel. And the second-place vessel Was a little better designed and floated really well. Most of the boats had a really good story line that went along with them. And the crowd loved watching the competition. It was our turn next. In this picture here we can be seen loading the soda cans into the cargo hold. 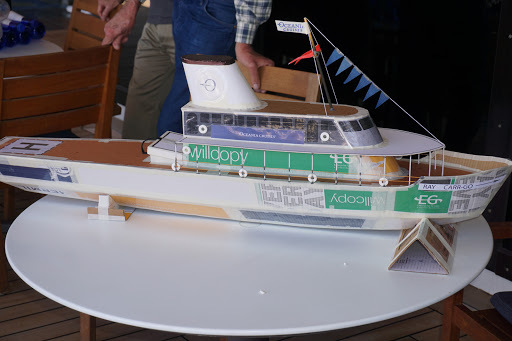 I actually didn’t know how the ship would sail as we were not going to test it in the water because it was made from cardboard. But of course there wasn’t much to worry about. The boat floated fine and was able to sail from one of the pool to the other with a simple push. 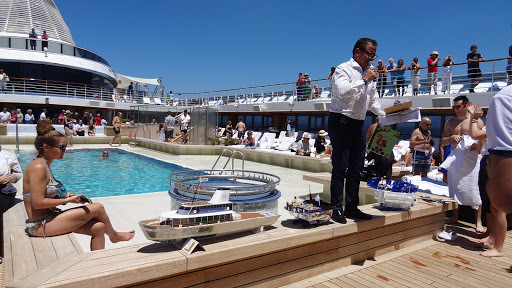 After the competition the boats were on display around the poolside and awards were handed out by the cruise director. Big O points were awarded to each of the contestants. 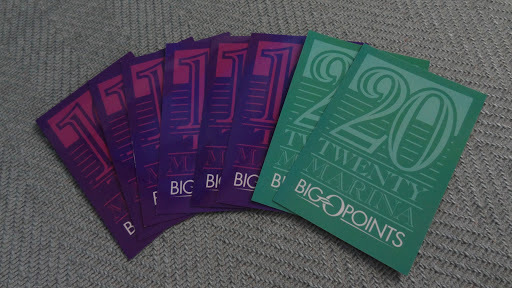 We used our Big O points to buy four T-shirts that were packed in the shape of the Oceana ship the Marina. Posing with our ship with the cruise director. And our friends from Switzerland Martin and Nicole. 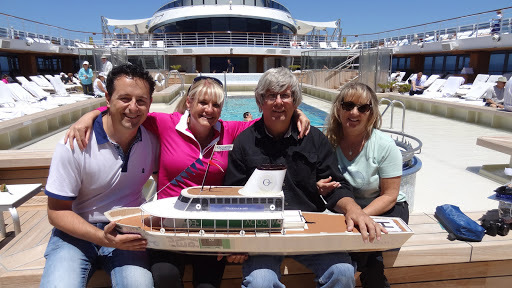 They were great fun and we spent quite a bit of time with them on board the ship as well as on excursions during the daytime. 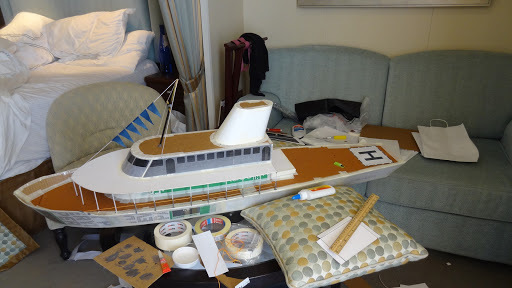 After the competition the ship was put on display at the reception desk for the rest of the cruise. 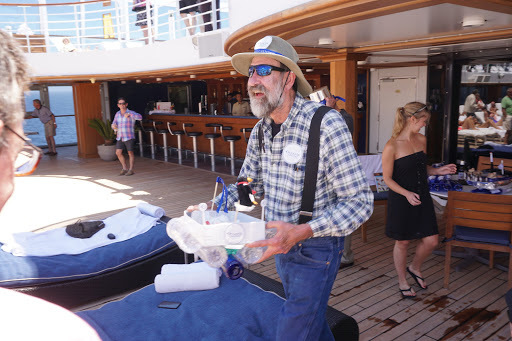 For the rest of the cruise we became known by the other passengers as as the ship builder people.